South Korea's Vice Unification Minister Chun Hae-sung met with a senior U.S. official and discussed the outcome of recent negotiations between the United States and the North in Pyongyang. The Unification Ministry said Sunday that Chun's meeting with Deputy Assistant Secretary for North Korea Alex Wong took place on Saturday and the two sides agreed to cooperate closely to make substantial progress in efforts to improve inter-Korean relations and realize denuclearization. Wong returned to Seoul on Friday night after accompanying U.S. Special Representative for North Korea Stephen Biegun on his three-day trip to Pyongyang for talks to prepare for a second summit between U.S. President Donald Trump and North Korean leader Kim Jong-un. 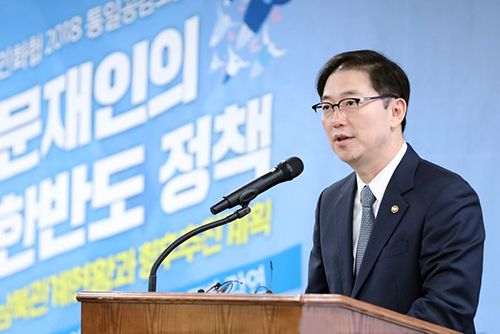 Attention is being drawn on whether the vice minister and Wong exchanged views on resuming inter-Korean exchange projects such as the Gaeseong Industrial Complex and tours to the North's Mount Geumgang.